On December 7, 1941, the Imperial Japanese Navy Air Service’s surprise attack on the U.S. Naval Base situated in Pearl Harbor on the island of Oahu in Hawaii, sent a shock around the world. On that perilous day, the attack was led by 353 Japanese aircraft that launched multiple air assaults. It resulted in eight U.S. Navy battleships being damaged or sunk, left 2,403 Americans dead and wounded 1,178 more. Although a surprise, the bombing of Pearl Harbor followed years of growing tensions between the United States and Japan. Japan’s sole intent was to eliminate American naval fleets and air forces in the Pacific Ocean, in order to keep the United States from interfering in its planned attacks on targets in Southeast Asia. The United States objected to Japan’s invasions of China and French Indochina, in addition to its alliances with aggressive dictators in Italy and Germany. In 1940, the United States enacted economic sanctions against Japan. Following failed negotiations to end the sanctions, Japan planned the Pearl Harbor attack. The following day, President Franklin D. Roosevelt delivered his famous patriotic and pathos-filled speech to a joint session of Congress, moving them to declare war on Japan, marking the United States’ entry into World War II. President Roosevelt’s speech broadcasted by live radio – attracted the largest audience in United States radio history – with more than 80 percent of American homes tuning in. •	Beginning at 7:55 that morning, the attack lasted 110 minutes and resulted in a significant loss of life: 2,403 U.S. personnel were killed, including 68 civilians, in addition to another 1,178 wounded. In the attack, one Japanese soldier was taken captive and 129 Japanese perished. •	In under 2 hours, all eight U.S. battleships were either sunk or damaged during the attack: USS Arizona, USS Oklahoma, USS California, USS West Virginia, USS Utah, USS Maryland, USS Pennsylvania, USS Tennessee, and USS Nevada. Amazingly, all but two (the Arizona and the Oklahoma) were eventually restored and returned to active duty. •	The following day on December 8, President Franklin D. Roosevelt declared war on Japan the next day as FDR gave his famous “Day of Infamy” speech to a joint session of Congress. •	On December 8, 1941, the day following the attack on Pearl Harbor, the United States declared war on Japan. Three days later, Germany and Italy declared war on the United States. •	The Japanese reportedly had intended to declare war prior to the attack so they would not violate the first article of the Hague Convention of 1907. However, the message was delayed and not relayed to officials in Washington until the attack was already in progress. Because there was no warning or declaration of war preceding, the attack on Pearl Harbor was determined to be a war crime during the Tokyo Trials. •	Every president since Franklin D. Roosevelt has visited the USS Arizona Memorial site. The WWII Valor in the Pacific National Monument, a National Park Service site, was built in 1962. The USS Arizona Memorial is one of the sites that make up the monument. It is the resting place for 1,177 gallant men who gave their lives in action on December 7, 1941. 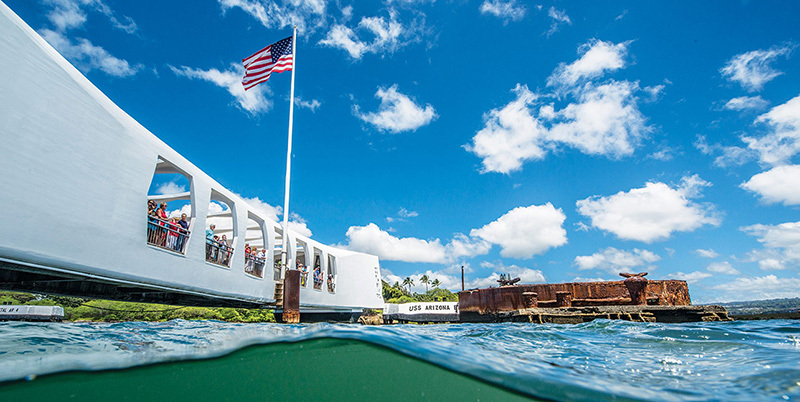 The 184-foot-long memorial, symbolizing the strength and resilience of the American people, honors the memory of the crew of the USS Arizona as well as all the other service members and civilian lost in the attack. September 2, 1945, marked the end of World War II when the Japanese formally surrendered to the United States on the deck of the USS Missouri in Tokyo Bay. In 1999, the USS Missouri was moved to Pearl Harbor and placed perpendicular to the USS Arizona Memorial. The site is open to visitors seven days a week from 7:00 a.m. to 5:00 p.m. It is closed on Thanksgiving, Christmas Day, and New Year’s Day. While admission is free, a ticket is required to visit the memorial. Resort Lifestyle Communities are filled with veterans – residents and team members alike – who selflessly served their country. 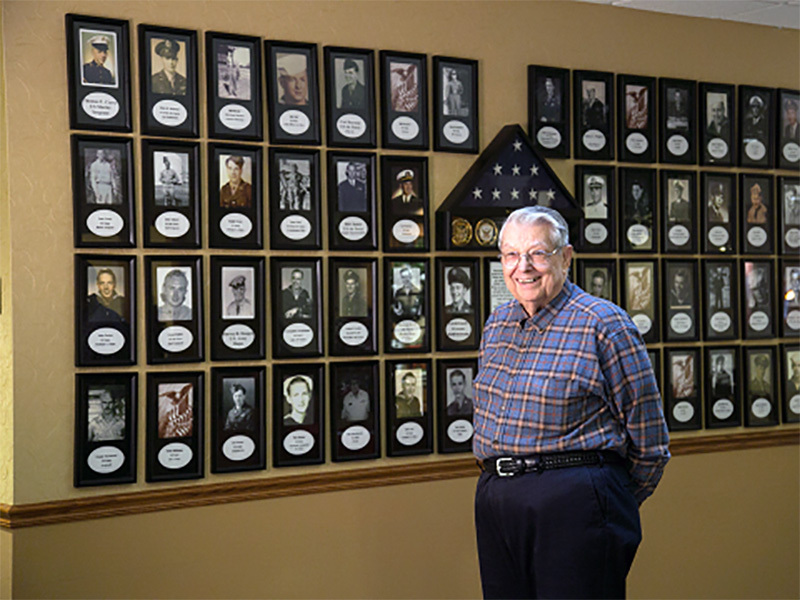 As a salute to our communities’ veterans, each community has a dedicated “Wall of Honor” which showcases residents who served in the military. The wall features their name, branch of service, military rank, role and photo from their individual time of service.